CrucianPoint launched the St. Croix Bridal Symposium website to digitally market this USVI Department of Tourism initiative. 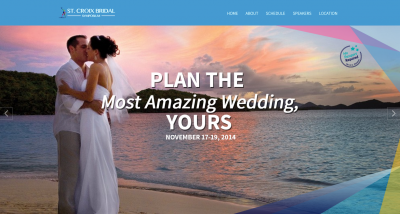 The USVI Department of Tourism hopes that the symposium will help tap into the growing nuptial travel segment. This bridal symposium will be the second held in the territory this year. The other symposium was held on St. Thomas in July. Tourism Commissioner, Beverly Nicholson-Doty, employed CrucianPoint to create a vibrant and informative website that showcases the endless possibilities available for wedding options in the territory; a strategy to increase bookings that will positively affect the territory’s economy. The St. Croix Bridal Symposium will be held on November 17-19, 2014 at the Renaissance Carambola Beach Resort.